Eagles quarterback Nick Foles hasn’t inspired much confidence due to his poor performance over the past two weeks. Back in 2011, the Atlanta Falcons were the top seed in the NFC playoffs, earning home field advantage throughout the playoffs behind a 13-3 record. But that didn't help them against the No. 6-ranked Green Bay Packers, who upset the Falcons in the divisional round of the playoffs 48-21 in front of a sold-out crowd at the Georgia Dome. It's a scenario at least one NFL executive believes the Eagles could repeat this season as they enter the playoffs without starting quarterback and MVP candidate Carson Wentz, who tore his ACL against the Los Angeles Rams. ESPN national NFL columnist Mike Sando spoke to four NFL coaches and executives, who collectively ranked the Eagles ninth out of the 12 teams competing in the playoffs, barely slotting the Birds ahead of the Blake Bortles-led Jacksonville Jaguars. According to Sando, the insiders thought it was possible the Eagles could win one playoff game at home, but not two. "I still think they can get to the NFC championship game, but at the end of the day, it is going to come down to Foles," one insider told Sando. "There is going to be a prove-it moment for Foles and I just don't know if he can deliver." Other pundits aren't quite so negative. NBC Football Night in America analyst and former NFL head coach Tony Dungy doesn't buy the doom and gloom surrounding the Eagles' first playoff run since the 2013 season. "I keep telling Eagles fans to relax. They are going to be fine," Dungy wrote on Twitter Monday afternoon. "Nick Foles will play well. The NFC Championship game will be in Philly." ESPN Monday Night Football analyst Matt Hasselbeck is also upbeat about the Eagles, telling my colleague Zach Berman that while Foles may not be the same style of player as Wentz, he thinks the Eagles can still win behind him. "I know everybody is jumping off the ship and freaking out a little bit because of the Monday night game [against the Raiders], but I've seen every quarterback have a game like that this year – Tom Brady vs. Miami on Monday Night Football, Case Keenum at Pittsburgh," Hasselbeck said. I don't think it's time to freak out quite yet." "Opponent winning percentage: .461; sixth-easiest. The Eagles matched a franchise record with 13 wins and finished fourth in FPI. Playing the sixth-easiest schedule might have helped. The Eagles went 9-0 against teams who finished .500 or worse." "Is it possible for the Eagles to regroup following the season-ending knee injury suffered by QB Carson Wentz and still reach the Super Bowl? Yes — fill-in QB Nick Foles is capable of playing well. The Eagles were the league's best and most balanced team for most of the season and they have home-field advantage throughout the NFC playoffs. But does it seem likely that the Eagles will reach the Super Bowl without Wentz? No. They haven't been anything close to the same team since his injury. They were shut out Sunday by the Cowboys in the regular season finale, and Foles failed to inspire much confidence in his abbreviated outing against Dallas." 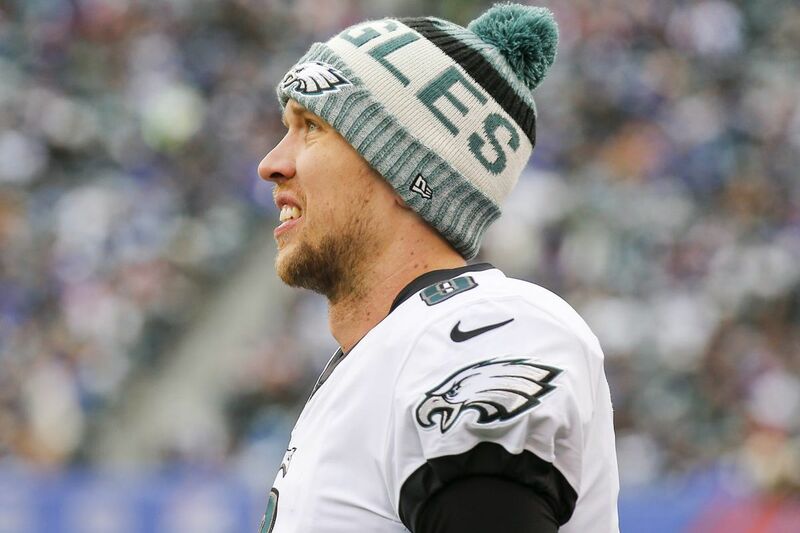 "Nick Foles does not give the Eagles much hope of advancing to the Super Bowl. If they had Carson Wentz, they would be the favorite." "Eagles fans are not going to enjoy seeing their team plummet further, but even this ranking might be too high. Nick Foles didn't play much Sunday, but when he did, he didn't exactly remind fans of Carson Wentz, or even A.J. Feeley. The good news here is that Philly's front seven is better than that of either the Panthers or Falcons, and that group received much-needed rest. As did Jay Ajayi. Perhaps Philadelphia can ride coordinator Jim Schwartz's defense and the running game in the Divisional Round. Got to make your kicks to win like that, though." "Oof. This was a discouraging game if you're a Philadelphia Eagles fan. It was good from the defensive standpoint, but I'm not worried about the Philadelphia defense in the playoffs. What I'm worried about is the offense without Carson Wentz. He was the best playmaker in football this season; there's no other way to say it. Philadelphia had one of the best third-down conversion percentages because of Wentz. They also had the most 3rd-and-long scenarios. That just shows the holes Wentz was covering in the offense. The way things look with Nick Foles under center, I believe the Eagles are a one-and-done team in the postseason. The defense will keep them in the game, but I don't see Foles delivering a victory." Former Giants running back Tiki Barber said in a video interview: "The Philadelphia Eagles won [during the season] on a great third down conversions, running the ball super effectively and playing good defense. They don't have that reliable third down conversion because Nick Foles looks rusty. … The last two weeks… we've seen a guy that looks lost, a guy that looks uncertain when he lets go of the ball. I think that's going to come back to haunt this Philadelphia Eagles team. … I thought they'd be okay, but after watching the last couple of weeks in games that matter, he didn't play well enough for me to say the Eagles remain the favorites." "Offense scored 16 points in regular season's final nine quarters. That projects to TD per game. You've got your playoff marching orders, defense." "The Eagles offense is sputtering without Wentz at the helm. Can Foles avoid mistakes and the defense step up?" The Eagles didn't have anything to play for, but getting shut out is never a great look. Especially when the quarterback who is supposed to carry the torch now that Carson Wentz is gone finished with a 9.3 passer rating. Nick Foles threw 11 passes before leaving the game, but completed just four of them for 39 yards and threw an interception. Philadelphia's defense is going to have to lead the way, but the Eagles' offense has to at least score a few points and that looks like a real problem."